Garden of Aaron: Clematis Make Great Cut Flowers! 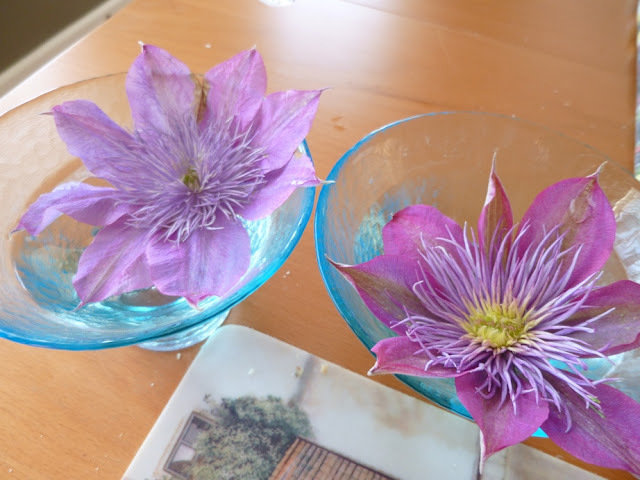 This is my first year getting flowers from my "Crystal Fountain" Clematis vine, purchased last year from Brushwood Nursery. I was curious as to whether clematis (or at least this particular clematis) would make a good cut flower, so I snipped an already-open bloom and floated it in a bowl of water. The bloom on the left has been floating in a bowl of water for approximately one week now. I haven't even refreshed the water! The one on the right was just cut today. Personally, I'm really impressed with the staying power of "Crystal Fountain" clematis as a cut flower. The stems aren't very long, so I don't see how it could work in a vase (unless you're an expert flower arranger and can get creative with wires), but it certainly makes a lovely floating centerpiece. Have you ever tried this clematis or any other as a cut flower? How did it work for you? And are there any fragrant clematis vines? Please leave a comment using the New and Improved Comment System below.